We Have Wheels, Foreign & Domestic Auto & light truck parts that Most Auto Parts Stores in Alachua, Gilchrist, Leon, Madison, Taylor County, and Old Town, FL Do not! 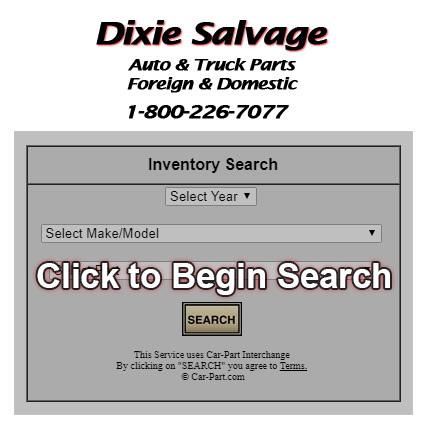 Dixie Salvage makes it easy to get the car and/or light truck part you need. This easy-to-use vehicle search will ensure you get the right part every time. Simply provide the required information and our computer database does the rest. PLEASE NOTE: A VIN (vehicle identification number) ALWAYS has 17 digits…no more, no less. Whenever a VIN is requested, quickly count the digits to ensure accuracy and maintain the integrity of our parts search before inputting the VIN. Thank you for choosing Dixie Salvage!